NEW YORK, May 23, 2018 /PRNewswire/ -- Purina ONE® announced today its continued partnership with Andy Cohen and his rescue dog, Wacha, to raise awareness for the brand's ONE Difference Campaign. The campaign celebrates how a single change, such as taking the Purina ONE 28-Day Challenge, can lead to a visibly healthy and lively pet. 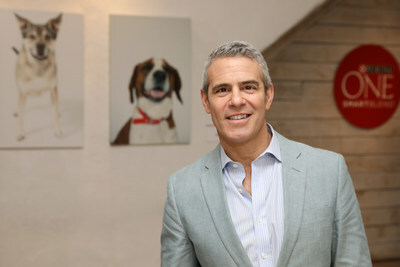 Andy Cohen hosts Gallery 28 by Purina ONE® to celebrate the brand’s ONE Difference Campaign in New York City on Tuesday, May 22. The gallery features never-before-seen photos of Andy and Wacha in their home, alongside beautiful images of shelter dogs from Petfinder.com – the site where Andy found Wacha. Purina ONE is supporting shelter dogs by donating $5, up to $28,000, to the Petfinder Foundation for every person who signs up for the Purina ONE 28-Day Challenge between May 22 and June 30. 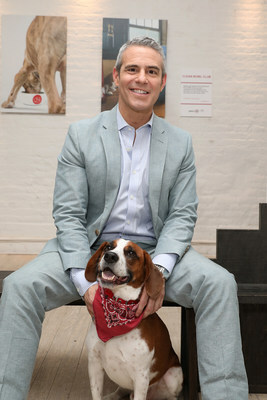 Andy Cohen and Wacha pose for a photo at Gallery 28 by Purina ONE®, which celebrates the brand’s ONE Difference Campaign in New York City on Tuesday, May 22. The gallery features never-before-seen photos of Andy and Wacha in their home. Purina ONE is donating $5, up to $28,000, to the Petfinder Foundation for every person who signs up for the Purina ONE 28-Day Challenge between May 22 and June 30 to help more dogs, like Wacha, find their forever homes. 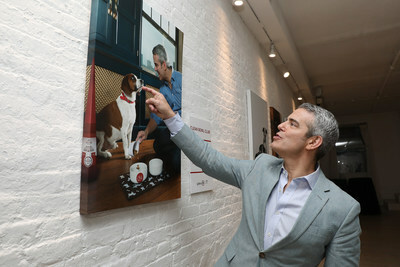 A touching moment; Andy Cohen reacts to a photo at Gallery 28 by Purina ONE®, which celebrates the brand’s ONE Difference Campaign in New York City on Tuesday, May 22. The gallery features never-before-seen photos of Andy and Wacha in their home. Purina ONE is donating $5, up to $28,000, to the Petfinder Foundation for every person who signs up for the Purina ONE 28-Day Challenge between May 22 and June 30 to help more dogs, like Wacha, find their forever homes. Andy Cohen admires the visible differences he’s seen in Wacha by feeding Purina ONE at Gallery 28 in New York City on Tuesday, May 22. The gallery features never-before-seen photos of Andy and Wacha in their home. Purina ONE is donating $5, up to $28,000, to the Petfinder Foundation for every person who signs up for the Purina ONE 28-Day Challenge between May 22 and June 30 to help more dogs, like Wacha, find their forever homes. As part of this campaign, Andy and Wacha hosted an event at a New York City gallery featuring never-before-seen photos of Andy and Wacha in their home, alongside beautiful images of shelter dogs at North Shore Animal League America and featured on Petfinder.com – the site where Andy found Wacha. The gallery images featured the visible differences that Wacha and the shelter dogs experienced after being fed Purina ONE, including bright eyes, a shiny coat, healthy energy, and strong teeth and healthy gums. "I rescued Wacha through Petfinder, and for the past few years we've been working with Purina ONE," said Cohen. "Ever since we took their 28-Day Challenge, switching Wacha's food to Purina ONE, I've noticed visible differences, like a shinier coat, brighter eyes, healthier-looking teeth and gums, and a lot of energy. And he really loves his food! He still runs to his bowl every morning." This year, the brand is supporting shelter dogs by donating $5, up to $28,000, to the Petfinder Foundation for every person who signs up for the Purina ONE 28-Day Challenge between May 22 and June 30. The donation will help support the Petfinder Foundation in its mission to help more dogs like Wacha find their forever homes. "Andy and Wacha have been a crucial part of our Purina ONE Difference Campaign over the past few years, which strives to make all dogs visibly healthy and aims to promote pet adoption," said Joe Chatman, Purina ONE brand director. "They have a great success story to tell, and serve as an example of how any dog can be healthy when provided with the high-quality nutrition found in Purina ONE." For more information, visit http://www.purinaone.com/MakeONEdifference where dog owners can take the Purina ONE 28-Day Challenge, view testimonial videos, and use tools to find out which Purina ONE SMARTBLEND® dry dog food formula is right for their dog. Purina ONE helps support your dog's whole body health every day and throughout his lifetime, with formulas that address his changing needs at each life stage. Purina ONE nutrition is veterinarian recommended and proudly crafted at Purina-owned U.S. facilities. Petfinder® is a leading online resource for pet adoption, education, awareness and advocacy. Petfinder's searchable online database of adoptable pets is updated daily and includes a directory of more than 11,000 adoption organizations across the United States, Canada and Mexico. Petfinder also includes a library of free pet-care articles to help keep pets in their homes. Since 1996, Petfinder has helped more than 25 million pets find forever homes. Petfinder joined the Nestlé Purina family in 2013. The Petfinder Foundation assists the 11,000+ animal shelters and rescue groups that post their adoptable pets on Petfinder.com. A nonprofit 501(c)(3) organization, the Petfinder Foundation helps adoption organizations through its Sponsor A Pet Program, Disaster and Emergency Response aid, and other grant opportunities. Since its founding in 2003, the Petfinder Foundation has given more than $20 million in cash and product grants to shelters and rescue groups in the United States, Canada and Mexico. To learn more about the Petfinder Foundation, please visit www.petfinderfoundation.com.